Picture this – you’re driving behind an enormous tractor trailer on a single-lane road. Can’t see anything in front of you, right? These large trucks can often pose a danger to drivers on the road, but now Samsung wants to help out with that issue. 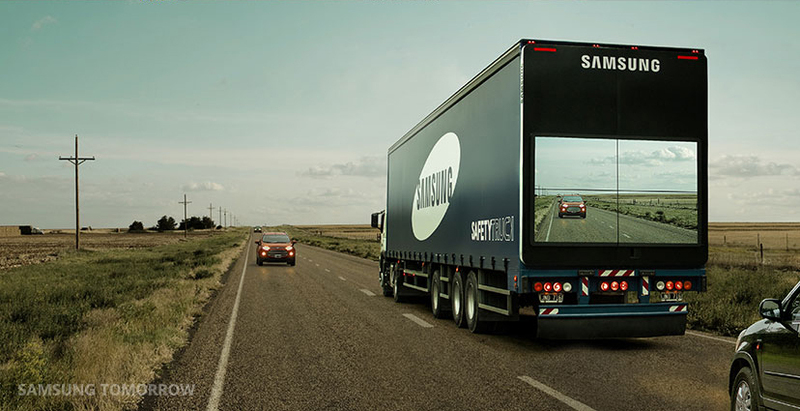 Samsung has proposed a Safety Truck that would allow drivers to actually “see” right through it. The truck would consist of a wireless camera attached to the front of the truck. The camera would then be connected to a video wall made out of four exterior monitors located on the back of the truck. The monitors would give drivers behind the truck a view of what is going on ahead, even at night. The purpose of the technology is to allow drivers a better view when they’re deciding whether it is safe to overtake. According to Samsung, another advantage of the Safety Truck is that it may reduce the risk of accidents caused by sudden braking or animals crossing the road. Samsung built a prototype truck and provided large format display samples. The company conducted testing with a local B2B client. According to Samsung, the technology does work, so the company’s next step is perform tests required for existing national protocols, as well get permits and approvals.